A Family of Cats and Puppy. 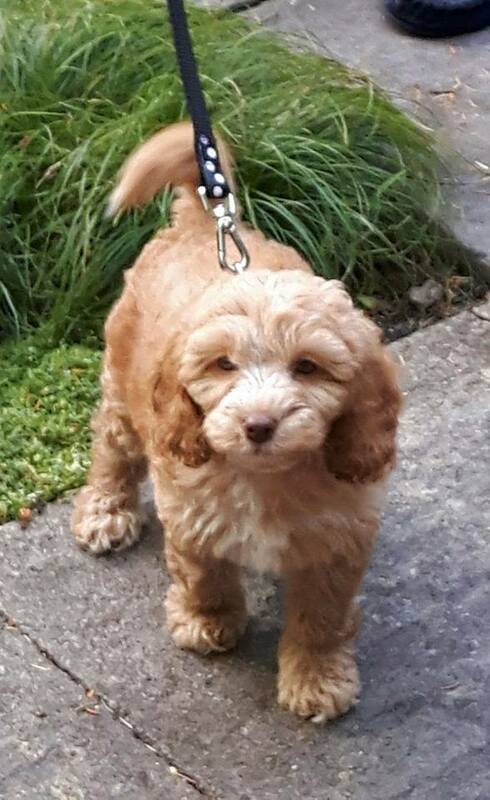 Meet Connie, our Cockerpoo. Born on the 5th June 2017, we collected her from the breeders near Leek on the 3rd August - what a cutie! A new companion for Rufus. You can see they soon got acquainted. 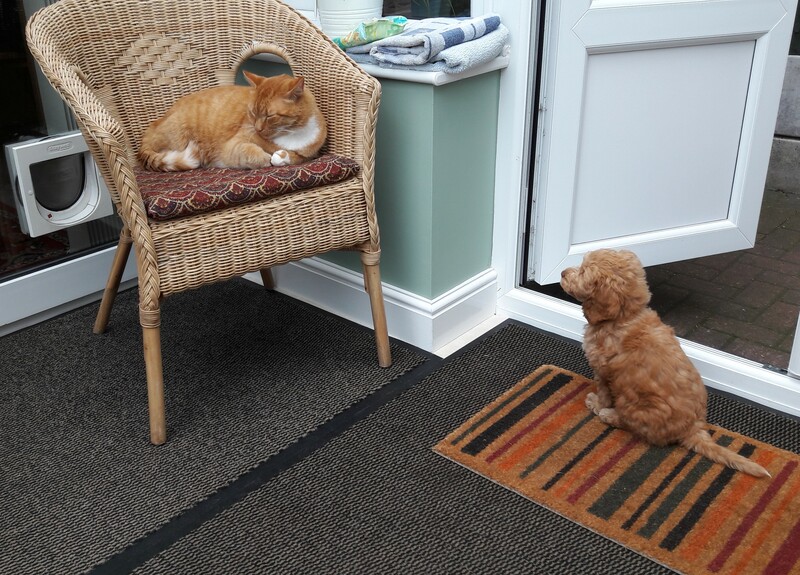 She was very keen to be friends with him and he was a very tolerant fellow. He only sat on her once! 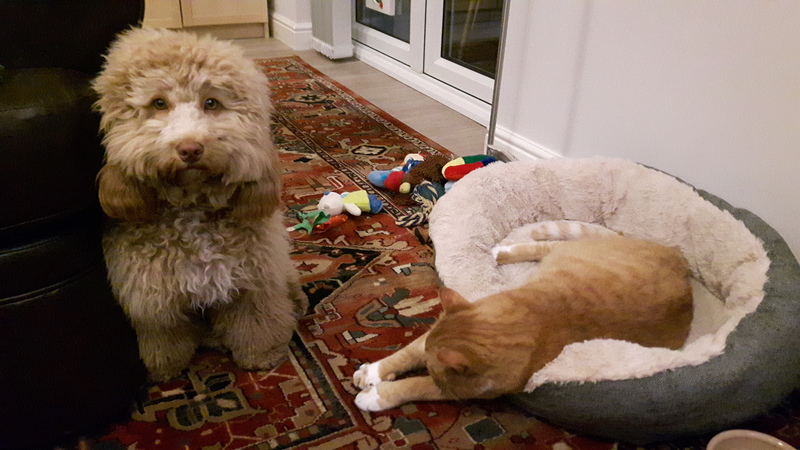 They quickly become good pals. Rufus, (201? - 2018, official birthday 25 November). This young lad appeared on our fence in November 2014, and seen eating the bird food on the ground. 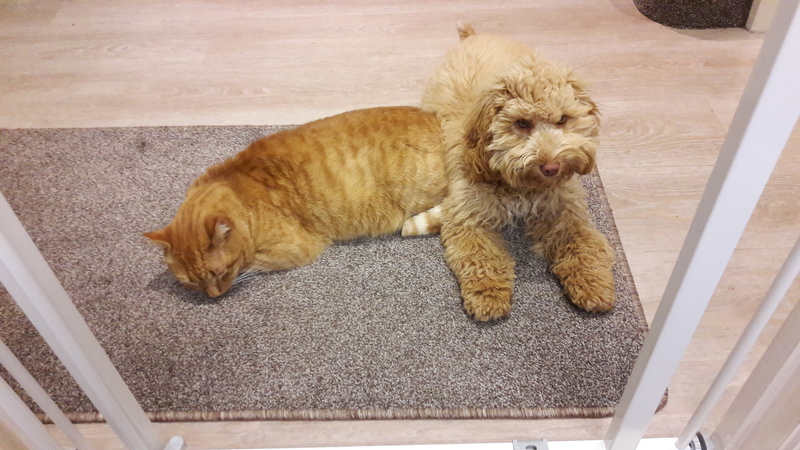 Over the Christmas period he overcame his wariness and became friends with us. In the new year Lynne put a 'find me' collar on him. During a very cold spell we allowed him in at night. We adopted him in February 2015. He was of an uncertain age, but not old, and very fit. After a while he settled in, if a bit feisty, and was almost a proper - if not very loving ("Where's me dinner?") - cat. He was a chap who knew what he wanted and he wanted it now... He'd put up with about thirty seconds fuss. Tops. 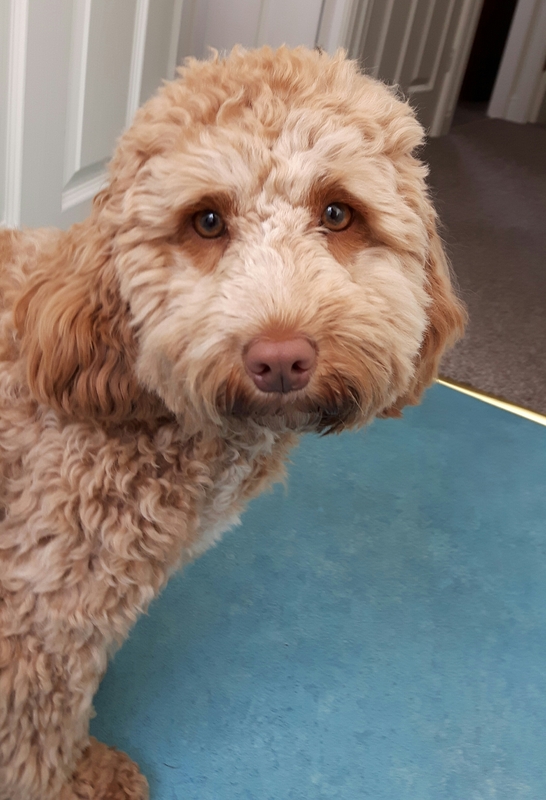 He became poorly at the end of February 2018 and didn't recover from an operation to deal with his blocked urethra. The nice lady vet put him out of his agony on the 2nd March. 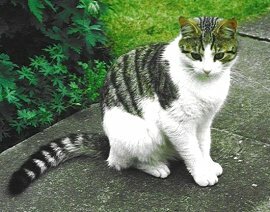 Poppy (1997-2015) joined the family, on a trial basis in the autumn of 2001 (born 27 April 1997). She later adopted us. She didn't get on very well with Otis (see below), and they warily avoided each other, indulging in occasional hissing bouts. There were few fights though (that we know of!). Poppy was a lap cat, when it suited her, and spent most of the time lying on something comfortable. Usually on the back of an armchair, next to me on the sofa or, since Otis's death, sprawled across the family bed. Once the sole survivor, she was the Queen of the Hill she always wanted to be. Poppy went blind after a short illness in December 2014. Her home became the living room with access through the cat-flap into the conservatory. She was a healthy old maid, subject to disorientation sometimes when seeking her food or litter tray, but in the following weeks she went downhill very rapidly over a couple of days and was put to sleep on 8 March 2015. 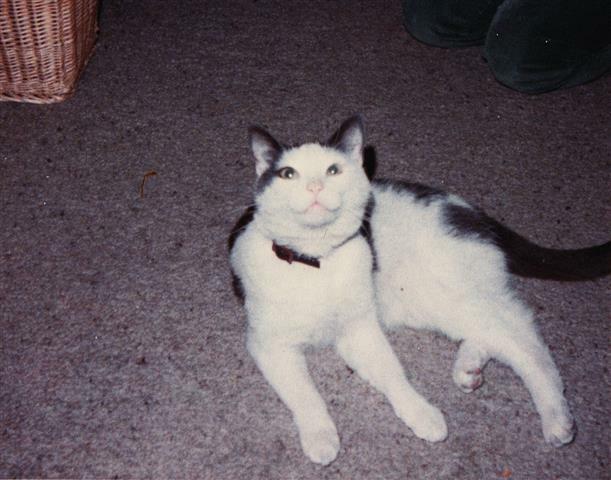 Otis (1994-2012) was our eldest. Born in April 1994, she originally belonged to a neighbour, who named her after the American soul legend Otis Redding. As a kitten she to used to come over and keep Lynne company in the garden, but went near 'feral' when the neighbour acquired two more kittens (Skitz and Ceefa, see below). Lynne soon realised Otis was living in the wild and enticed her into our home. We adopted her in June 1996. She became a fully rounded cat and as an old lady preferred to stay indoors and be asleep in her favourite place - all over the family bed. She did not like the company of other cats but remained our black beauty. Otis became a little more fussy as time marched on. Late in 2012 her health began to fail, resulting in her increasingly having fits, blind in both eyes and finally becoming distressed and confused. We had her put to sleep on the 14th December. 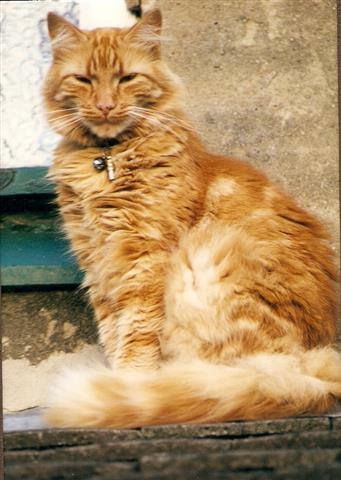 Chester (1994-2008) came to live with us on the 1 August 1994. He was about 5 weeks old, so we gave him an 'official' birthday of the 25 June. We had collected him from a poor home. Covered in fleas, and no doubt weaned from his mum too soon, he never learned to eat properly, often sicking up his food. 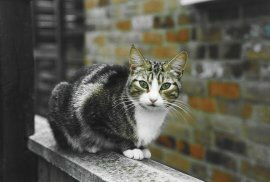 He's was an independent cat, who used to spend most of his time out of doors snoozing at the bottom of the garden or, in the winter, sleeping on the marital bed. He wasn't a fighting cat, but would stand his ground to scare away intruders. 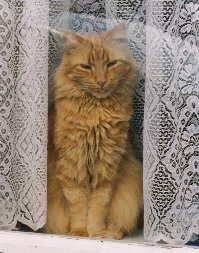 He was a gorgeous fluffy ginger thing and, although he looked his age, continued to be simply happy to be here (when he wasn't grouchy). 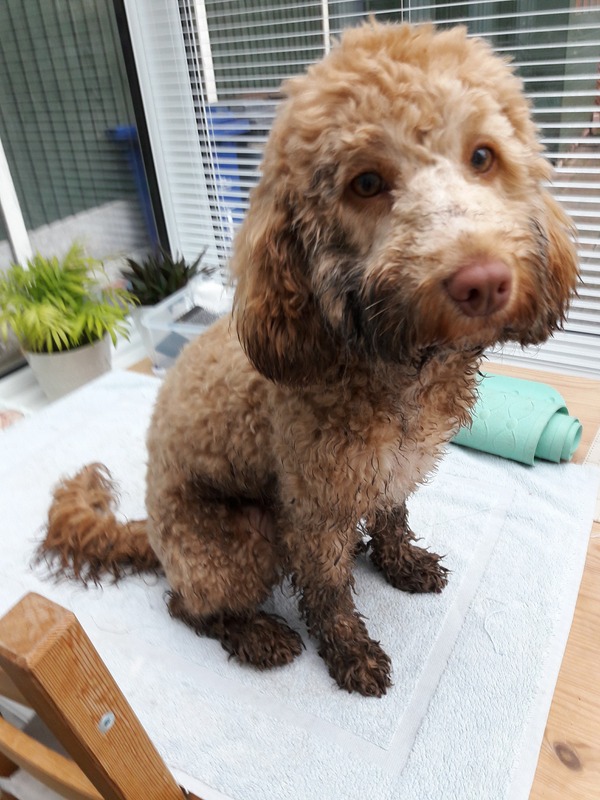 While our former house was in a mess during major works, Chester appears to have eaten something he shouldn't have and poisoned himself. He died on June 12th 2008 and is buried under the big tree at the foot of that house's garden. RIP sweetheart. 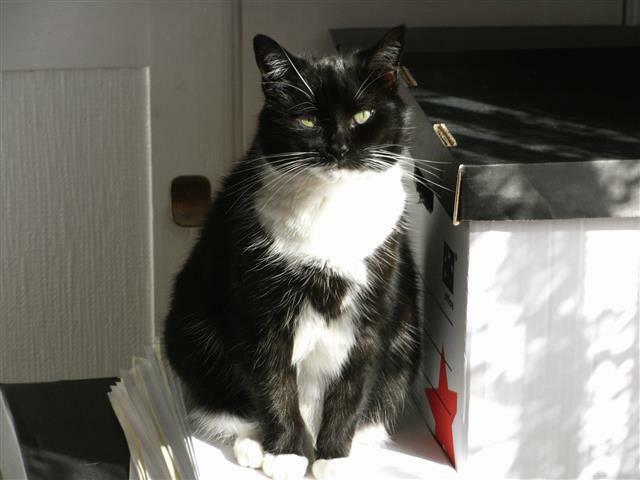 Skitz (1996-2001) took over at the neighbours house (along with Ceefa), and a year later she gave birth to four kittens. Three were found new homes but Poppy (see above) held back. 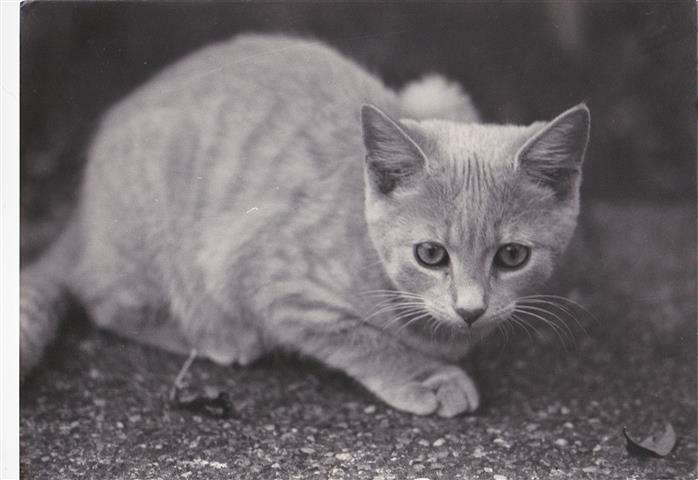 In 2000 the neghbour moved on leaving the cats behind, promising to collect them when 'things got better'. He didn't. Skitz was eventually adopted by other neighbours who later moved away, taking her with them. We subsequently heard that she was lost, probably a killed by a vehicle on the busy road near her new home. We took on Ceefa (1996-'2005') as well, of course. 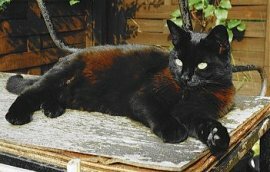 Born 15 April 1996, he was an outdoor (ex-) tomcat who protected his domain with vigour and lived in the garden shed until October 2004 when the fireworks freaked him so much he practically beat the cat flap down to get in the house. Although he was a very affectionate and willing cat who only wanted to be loved, he became one cat too many. 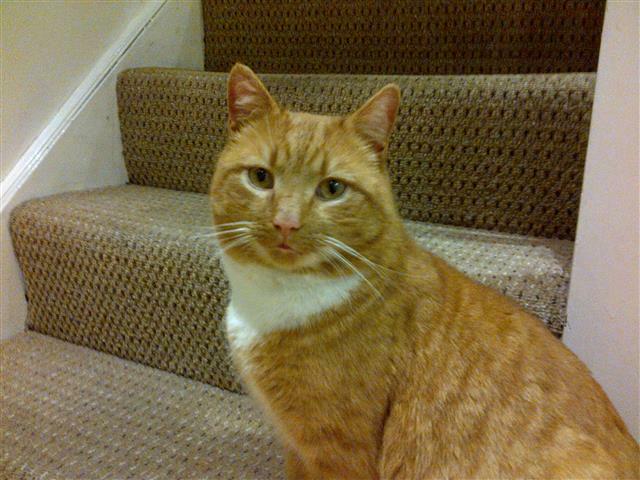 We managed to get him taken in by the Cats Protection charity in Derby a year later. grey and white Bunker (1975-1991) and later Porter (1983-1994), a pale ginger model. Thinking about adopting a furry companion? Pet adoption is lots of fun, but it does take time to plan and research. For more, go to The Homeoanimal Family. Tips on looking after pets in small homes - Highrises, pet care in condos and apartments.